With its 24-hour battery life, surprisingly good bass, and crystal-clear sound quality, the Anker SoundCore has long been our readers’ favorite affordable Bluetooth speaker. 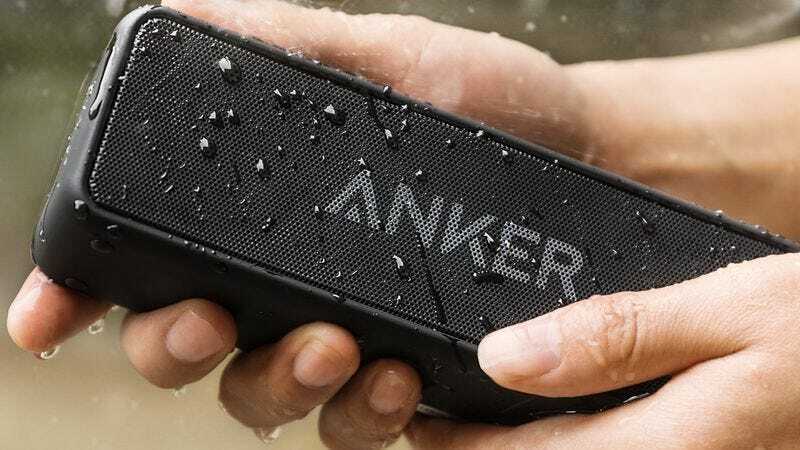 But its run may be at an end, because Anker just upgraded it with IPX5 water resistance, and you can get the new model for $8 off today. The SoundCore 2 still includes dual drivers and that amazing 24-hour battery; the only real differences are a slightly tweaked design and the aforementioned water resistance. That means you can take it to the pool, the beach, or even the shower without fear. You don’t need to sell a kidney to afford noise-cancelling Bluetooth headphones; these four-star-rated Cowin E-7s are just $39 right now, or $31 off with promo code 4BW672VA. Obviously, this won’t be as flexible as a rubber- or nylon-coated cable, but it’s impossible to tangle and should stand up to even the most reckless iPhone owner. Plus, it just looks really damn cool. It’s a tough sell at $18, but for a limited time, you can try one out for $9 with promo code ICCABLE3. Like the T-02, the T-04 can attach to basically any surface via the included adhesive strips and will automatically light up when it detects motion in the dark. The main difference is the battery: Rather than charging AAAs or plugging in a micro-USB cable, the T-04’s battery pack is fully detachable and plugs directly into any USB-charging port. I have a couple of these set up around my apartment, and they work extremely well. If you’ve had your eyes on a Fitbit (may we recommend the Charge 2?) or want to get one for Dad this month, nearly the entire lineup is on sale right now on Amazon, with discounts ranging from $20 to $50. If you missed out on God Of War III on PS3 or if you just want to replay it in 1080p/60, the PS4 remastered version is down to just $15 for Prime members, complete with all of the game’s DLC. Amazon always offers a free one-month trial of its Audible audiobook service, but for a limited time, it’s also tossing in an extra free book credit to sweeten the pot. That’s in addition to the book you normally get with the trial, and each credit is valid for any title in the Audible library. The best part? The books you choose are yours to keep, even if you cancel the trial before it renews.